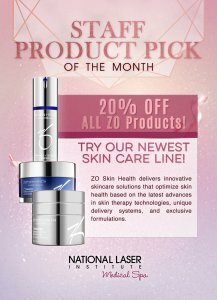 The National Laser Institute could not be more excited to introduce our newest skincare line, ZO Skin Health. Get a healthy and glowing complexion with the ZO Skin Health product line. Everything from cleansers and masks to brighteners and retinols, these serums will help prevent and correct skin blemishes. This scientifically developed product line is chock-full of healthy growth factors to deliver unparalleled results. Created for all skin types, ages, and sexes, these products exfoliate, tone, protect, and enhance your appearance for a beautiful and youthful complexion. All ZO Skin Health products are created with the world’s most innovative and effective skin health formulas. ZO solutions are effective for daily skincare regimens, as well as skin disorders and chronic conditions. All ingredients found within these products are safe, tested, and scientifically created to revitalize skin. To welcome this new, luxury line to our med spa, all ZO products will be 20% off throughout the month of March. Enjoy the many benefits the latest scientific advances in skin-therapy technologies has to offer. Your complexion will thank you for achieving and maintaining healthy skin! Furthermore, our state-of-the-art facility offers advanced aesthetic beauty services such as laser treatments, peels, and facials. Achieve a youthful and rejuvenated appearance that radiates from the inside out and the outside in. Visit our medical spa where we accept only the Gold Standard in aesthetic treatments. Click here to view our full list of services. Call 800-851-0969 to redeem your 20% off the ZO Skin Health medical grade products. Allow us to assist you in getting started with your skin care needs. Your journey to younger, healthier skin can begin today. Make skin health easy with ZO. Furthermore, click here to become one of our Beauty Insiders and discover all that The National Laser Institute has to offer. Be the first to learn about new products, treatments, and contest giveaways. It is our mission to get you the skin you have always dreamed of and deserve.